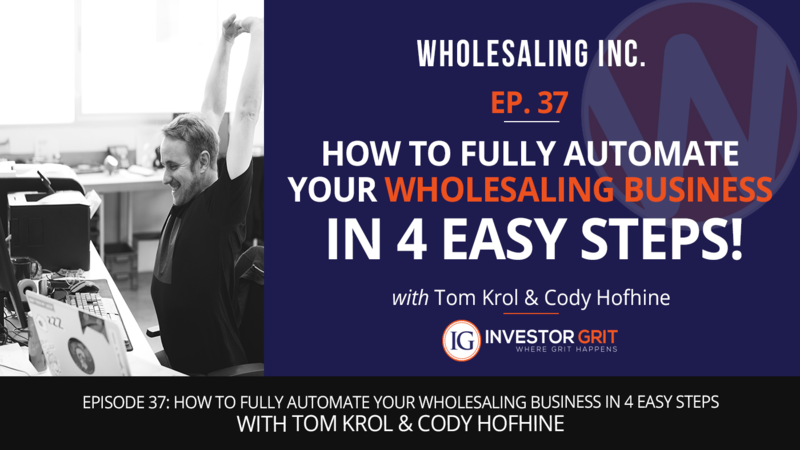 Episode 37: How to Fully Automate Your Wholesaling Business in 4 Easy Steps! How to Fully Automate Your Wholesaling Business in 4 Easy Steps! Do you have a Wholesaling Job or a Wholesaling Business? For quite a few people, that is a hard distinction to make. In this episode, I talk about how to turn that Wholesaling job into a Wholesaling EMPIRE! There is only ONE way to do that…AUTOMATE!! I reveal 4 simple ways to automate your Wholesaling business so you could create a business that is a servant to YOU, instead of the other way around. I show you EXACTLY what to look for in a Virtual Assistant. I show you where I get all MY VA’s (I have 7 of them) and even give you some Ninja tactics for getting the BEST VA’s (you don’t want to miss this one)! I also talk about Acquisition Managers: Why you need them, what to look for and ESPECIALLY…what you must must must avoid! Take notes because there is a TON of information in this episode…and all in less then 15 minutes! If you know me, that’s how I do it! This is the no fluff, no BS zone! BAM! !